“Simultaneous discovery,” or “multiple discovery” is the theory that most major breakthroughs and inventions are made around the same time, completely independent of each other. You can see similar things happen in arts and entertainment, like when the Wachowskis and David Cronenberg unleashed similarly-minded virtual reality films (The Matrix and eXistenZ, respectively) within months of each other in 1999. In the spring of 1891, the world of questionable sports-related entertainment experienced a simultaneous discovery of its own. 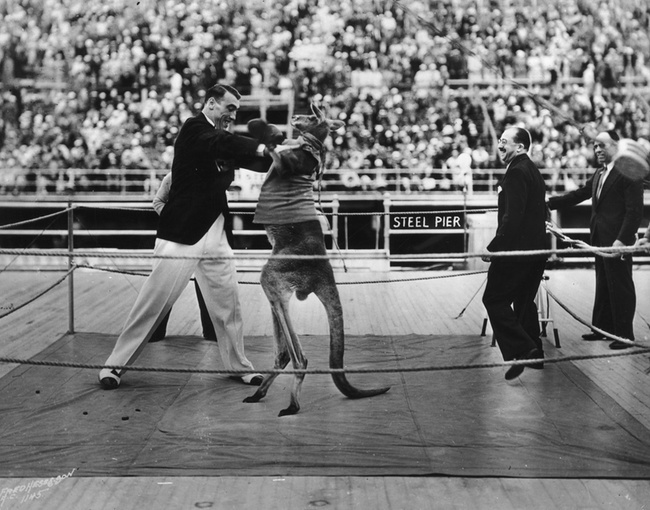 That was the year that kangaroo boxing broke, and it happened in both the U.S. and Australia at almost exactly the same time. According to “Australia’s Boxing Kangaroo – From Philadelphia?? ?” a highly detailed and impressively geeky post by Peter Jensen Brown at Early Sports and Pop Culture History Blog, the first reports of kangaroo boxing in Australia were published on March 20 (Barrier Miner, a paper Broken Hill, NSW) and March 26 (Table Talk, a publication from Melbourne, Victoria). The first U.S. report—which Brown believes might contain the first reference to a public match between a human and a marsupial—was published in the Phillipsburg Herald on April 2. 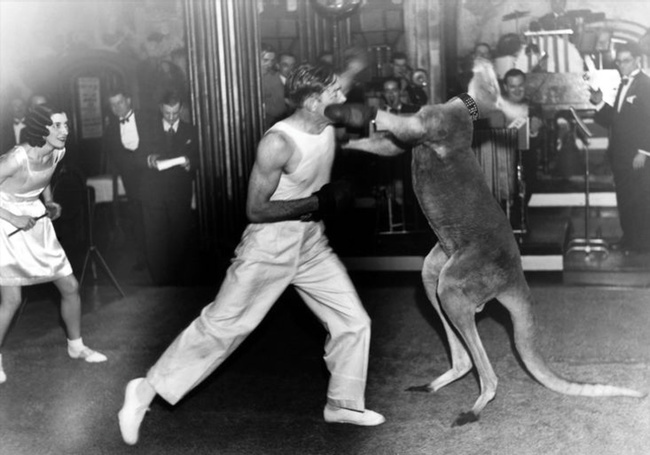 Australia’s breakout star was Jack, a kangaroo who put on a daily boxing display with a man named Professor Lindermann at the Melbourne Waxworks. The U.S. had John L. (named after one of the most beloved boxers of the day, John L. Sullivan), a resident of the Philadelphia Zoo who “sparred” with his trainer after showing an apparent aptitude for the sweet science. This supposed natural inclination toward pugilism was little more than a combination of the kangaroo’s natural defenses and its posture. Kangaroos fight by using their forelegs (or “arms”) to grab on and hold their opponent (sort of like a clinch). To kangaroos, this stance is really a means to an end. They’re grabbing on so that they can kick with their sizable and powerful hind legs and potentially disembowel their foe. But a bunch of people ostensibly in the care of these animals thought that it looked like they were assuming a boxing stance and decided to slap some gloves on their paws and “train” them. And then exploit them. The tone of the early articles on the subject are entirely uncritical, treating interspecies combat as an adorable novelty and the kangaroos in question as plucky credits to the animal kingdom who are smart enough to take boxing lessons (and, apparently, ask for them). The Phillipsburg Herald took on a similarly breezy tone when it came to John L.: “This really clever trick was taught him by his keeper, to whom he is very much attached. One day while going in to clean the cage the keeper noticed that “John L.,” hitherto morose, showed a decided inclination to play. He reared himself on his hind legs and put up his “props” just like a fighter. The keeper put his “dukes” up too, and advanced on “John L.” The result was a rather clumsy exhibition of the manly art. Toward the end of the 1890s and the early 1900s, though, the public began to lose interest in the phenomenon. Not because it was cruel to the animal half of the bouts and downright deadly for the humans involved, but because it was starting to bore them. “One of the wallabies at the Zoo does exactly the same,” a writer for New Zealand’s Bruce Herald opined in an article from April 30, 1897. The practice of forcing actual kangaroos to box didn’t completely die out after that (and still hasn’t, unfortunately, even the laziest of YouTube searches will turn up a number of recent videos) but the idea of the boxing kangaroo became far more popular than the real thing. An animated film called “Boxing Kangaroo” debuted in 1920. Disney jumped into the fictional boxing kangaroo game with three Silly Symphonies that involved the creatures in some way, the most famous of the bunch being “Mickey’s Kangaroo” from 1935. The fighting roo has been an animated classic ever since, appearing everywhere from Looney Toons and The Flintstones to The Simpsons and Futurama, to Sailor Moon and Naruto. Images of the creatures wearing boxes gloves were painted on the sides of Australian aircraft and ships in World War II. The Australian Olympic team still uses one as their mascot. In terms of live action, the fictional boxing kangaroo reached its peak, if you can call it that, in 1978 with the release of Matilda, a film in which Elliot Gould plays a boxing promoter who works with, well, you guessed it. Robert Mitchum also starred in the movie. It was not a box office success. That wasn’t the worst thing to happen to boxing kangaroos in that era, though. That dubious honor goes to an episode of an obscure British show called Europe’s Big Top Circus Stars Live from the Hippodrome in which Woody Allen stepped into a makeshift ring to fight an actual kangaroo. Strangely, the kangaroo didn’t really seem to enjoy being forced to fight a questionable human being (and arguably overrated artist) in front of a squealing crowd and was clearly too scared to disembowel anyone. Allen’s display seems to have been the last gasp of the mainstream exploitation of kangaroos in this manner, though. And even the tone of fictional stories seems to be evolving to reflect the reality of the situation. On shows like Andy Richter Controls the Universe, The Mighty Boosh, and even Hannah Montana Forever, the joke is no longer on the kangaroo, but on both the cruelty and absurdity of interspecies combat. 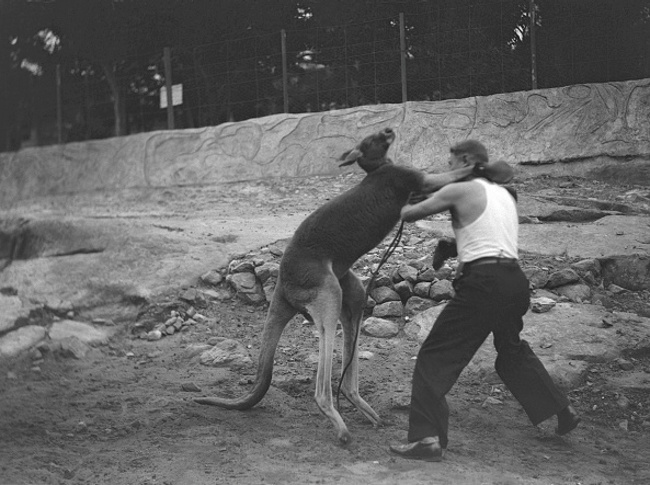 Besides, as we learned here at Fightland last year, an even match between two kangaroos is far more interesting.